The Dallas Mavericks will host a FANtastic Finale tomorrow night during the Mavs vs. Suns game at American Airlines Center. Doors open at 6:00pm and tipoff is at 7:30pm. This special final game will salute the MFFLs who cheer on the Mavs all season long with an exclusive pre-game event for Season Ticket Holders, Giveaways and plenty of fun! · Mavs Season Ticket Holders are invited for an exclusive pre-game happy hour at 6:00pm in the EIGHTEEN|76 Bar at American Airlines Center. Mavs will showcase the new Ripples Beer Foam Printer for the first time in Dallas. Each Season Ticket Holder in attendance will receive a free Budweiser Mavs Hat and One (1) Free 12oz Budweiser draft with choice of Mavs logo on the top of each beer. Media is invited to attend—RSVP is required. 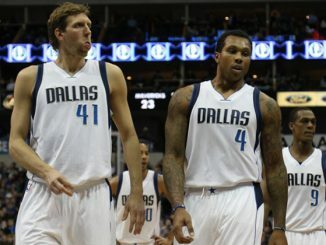 · Join the Mavs for Mavs Q, the first live and in-app trivia game in the NBA. FOX Sports Southwest Analyst Jeff “Skin” Wade will shell out 12 questions in arena for a chance to win upgraded seats for the game, autographed merch and floor seats for a game during the 2018-2019 Season. To play, fans should download the Mavs app. Trivia starts promptly at 6:30pm. · All fans in attendance will receive a FREE Mavs cap courtesy of Sprite upon entry. · All fans in attendance will receive a SPECIAL EDITION T-SHIRT featuring “Dallas For Dirk” courtesy of 5miles. The t-shirt was designed by local artists Reid Glaze and Hance Talpin in honor of Dirk’s 20th Season with the Dallas Mavericks. Find more of their designs at thanksdirk.com. · 10,000 fans in attendance will receive a Mavs Team Poster courtesy of Century 21 Mike Bowman. · 1 lucky Season Ticket Holder and 1 lucky fan will have a chance to win a 2018 Ford Escape Titanium (Estimated MSRP $32,140) by participating in a half-court shot contest during half-time. To register to win, visit mavs.com/winaford before 3pm today. · 1 Lucky Mavs fan will take to the Mavs Hangar with 1 minute to grab as much gear as they can in the Mavs Hangar Super Market Sweep Presented by NIKE. The winner will be selected from a pool of fans that have connected to their Nike Mavs Jerseys via the Nike Connect app. 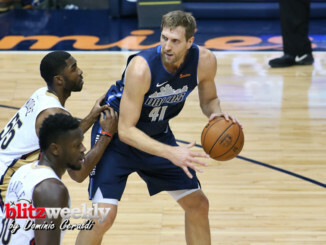 · Panini will give away 20K Mavs Trading Card Packs at doors and Chris Arnold will give away (2) Framed Autographed Pictures of Dennis Smith Jr. during the pre-game show and the game. 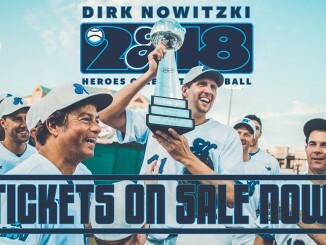 · WhichWich will give away 10K special edition Dirk Nowitzki cups in honor of the DirkWich promotion. Each cup with have a coupon for a FREE 32oz drink with purchase of a DirkWich at participating stores. For tickets to the FANtastic Finale, please visit mavs.com.